Gamefish, sometimes whole schools of them, often move into a tributary on a flood tide to feed. They all must pass through the inlet, concentrating their numbers. Once in a while, a school of fishnotably bluefishwill herd a school of baitfish into an inlet, where they can feed upon them easily. An angler who happens to be standing on a jetty at such a time can experience outstanding fishing. Much saltwater fishing takes place on inland waters, where many saltwater species can be caught. Inland waters are better protected from wind and high waves, provide easier access, and often produce good fishing. For the boatless fisherman, tidal rivers, creeks, bays, and backwaters offer thousands of miles of shoreline from which to cast. Also, many business offer small boats that can be rented by the hour or by the day. Although these inland waters aren't frequented by oceanic species such as tuna, many other popular fish, such as flounder, bluefish, striped bass, redfish, sea trout, weakfish, kingfish, and a variety of saltwater panfish, can be found there. As in the surf, these fish are influenced by the tide, but are found in specific places. Many inland waters are crisscrossed by navigation channels, which are deeper sections or stretches of water and are marked by buoys. 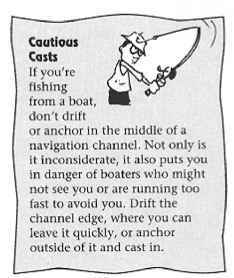 Boats must travel in channels so they don't run aground in the shallower water surrounding the channel. During low tide, some boatseven relatively small onescan't stray from the channel in some sections, or they'll hit bottom. Some channels are natural, but many are man-made. All are good spots to fish, because gamefish remain in the deeper water and feed upon forage that flows into it during a tide. 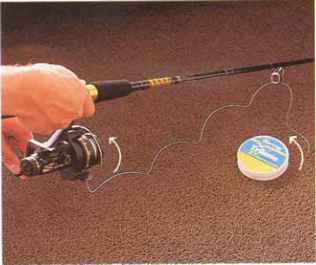 The edges of a channel are usually more productive than the middle of one, as gamefish often lie just below the edge to ambush bait. Bridges also attract fish, as the tidal currents rip around the bridge abutments and pilings, funneling forage. Also, navigation channels must run under bridges, another obvious target. Fish usually congregate on the down-tide side of bridges. Piers and dock pilings attract fish for the same reason. Occasionally holes or depressions form to the sides or in front of these structures, the result of tidal currents hitting the obstructions and scooping out the bottom. Drop-offs are found in many inland waters. Again, these may be natural (one side of a sand or gravel bar) or man-made (a retaining wall). Concentrate your efforts on the side of the drop-off, where gamefish typically congregate.